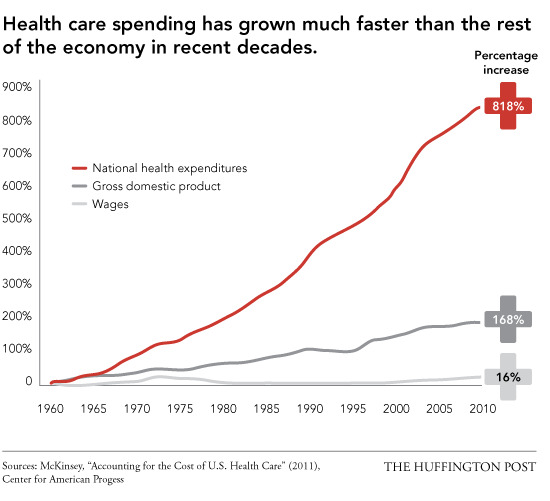 Meanwhile, households exposed to the actual cost of healthcare insurance are absorbing increases of $5,000 or more annually. $5,000 increases every year add up: $5,000 + $10,000 + $15,000 + $20,000 = $50,000 was extracted from the household budget over the four-year period. The household paying the unsubsidized cost of higher education is paying tens of thousands of dollars more for the same marginal-value education. 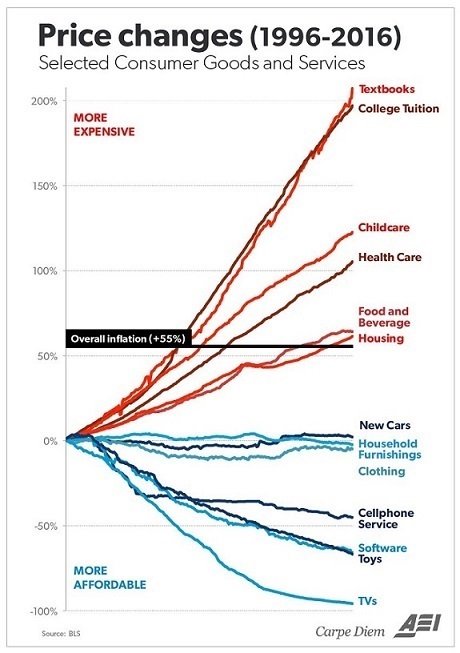 Where a four-year college degree once cost the equivalent of a new car (i.e. $30,000), now it costs the equivalent of a house in many parts of the U.S. ($120,000 and up). So a retiree with a small fixed-rate mortgage in a state with Prop 13 limits on property tax increases who qualifies for Medicare may complain about modest increases in co-pays for office visits and medications totaling a few hundred dollars annually, a young self-employed couple might be facing thousands of dollars in rent increaess, healthcare insurance costs, childcare expenses and so on--each a big-ticket item with a crushing impact on household spending and debt. 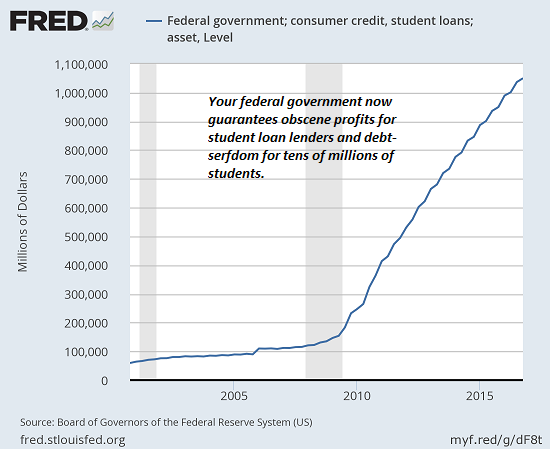 Getting that often-worthless diploma now requires debt-serfdom, enforced by your private-profit-are-guaranteed, losses-are-dumped-on-the-taxpayers federal government. Needless to say, the government is hear to help you--help you become a debt-serf whose serfdom enriches state-cartel cronies. 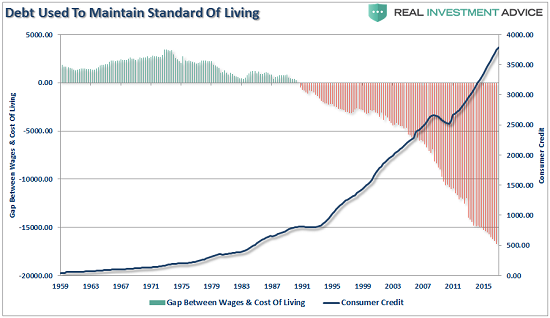 My insightful colleague Lance Roberts prepared this devastating chart that shows how debt-serfs deal with soaring prices--they borrow more to fill the widening gap between what they earn (stagnating) amd the cost of living (skyrocketing).